Cunningham's photonic crystal enhanced microscope sheds light on wound healing and cancer metastasis. University of Illinois Electrical & Computer Engineering and Bioengineering Professor Brian Cunningham’s Nano Sensors group has invented a novel live-cell imaging method that could someday help biologists better understand how stem cells transform into specialized cells and how diseases like cancer spread. 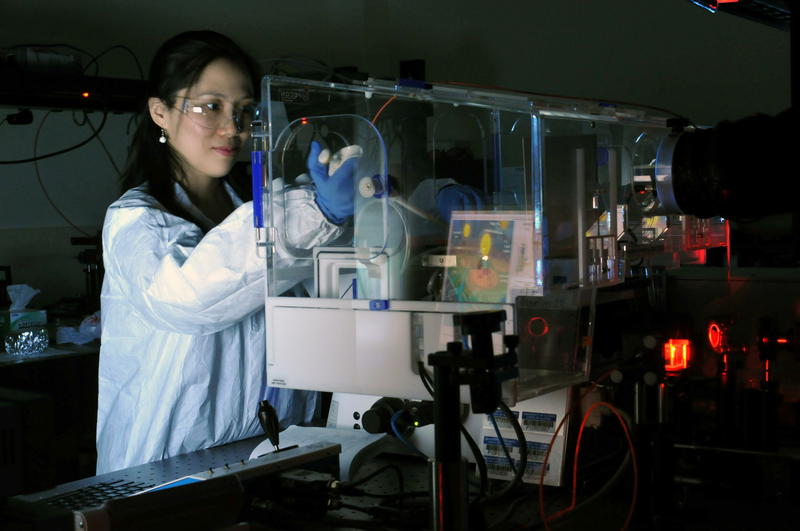 Their Photonic Crystal Enhanced Microscope (PCEM) is capable of monitoring and quantitatively measuring cell adhesion, a critical process involved cell migration, cell differentiation, cell division, and cell death. “Our approach is important because there are not currently label-free and high-resolution imaging tools that allow cell-surface interactions to be quantified and imaged dynamically, although these processes are fundamental to things like wound healing, tissue development, tumor invasion, and cancer metastasis,” said Cunningham, the Donald Biggar Willett Professor of Engineering and director of the Micro + Nanotechnology Lab. Most conventional imaging methods rely on fluorescent dyes, which attach to and illuminate the cell components so they are visible under a microscope. However, fluorescent tagging has its limitations—namely that it is invasive, difficult for quantitative measurement, and only provides a short-term window of time for cell examination and measurement due to photobleaching. 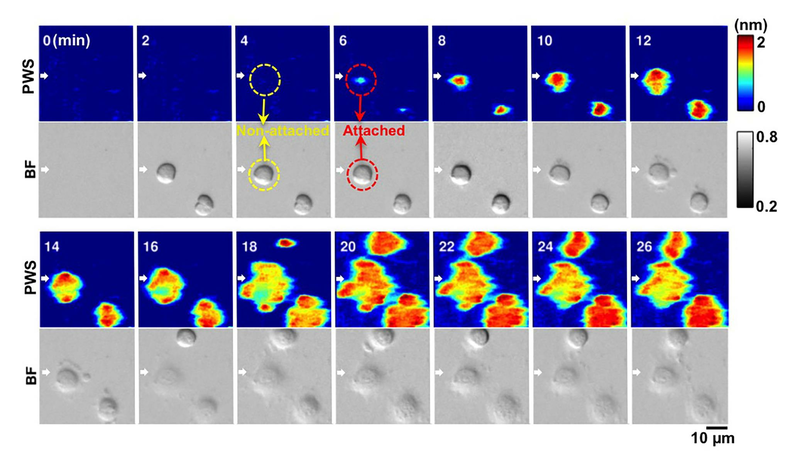 Label-free and dynamic detection of stem cell adhesion using the photonic crystal-enhanced microscope. The Illinois team’s microscope functions with an LED light source and a photonic crystal biosensor made from inexpensive materials like titanium dioxide and plastic using a fabrication method like nanoreplica molding. “Our sensor can be massively fabricated easily, and our cost to make the sensor is less than $1 each.” noted Zhuo. In Zhuo’s apparatus, the photonic crystal biosensor is an optical sensor which can apply to any attachable cells. The sensor surface is coated with extracellular matrix materials to facilitate cellular interactions, which are then viewed through a normal objective lens and recorded with a CCD camera. 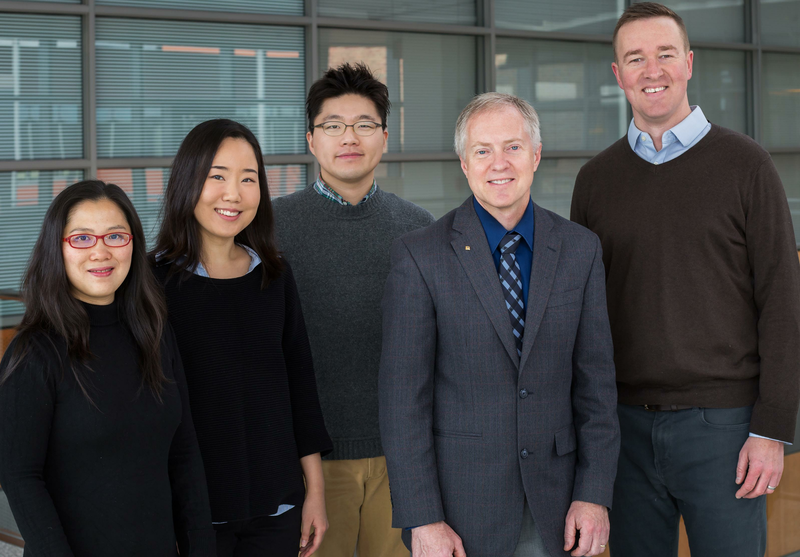 The Illinois research team that created the new photonic crystal enhanced microscope include: (left to right) Yue Zhuo, Ji Sun Choi, Hojeong Yu, Brian T Cunningham, and Brendan A Harley. This project was funded by grants from the National Science Foundation and National Institutes of Health. Fellow research collaborators include: University of Illinois Chemical and Biomolecular Engineering Associate Professor Brendan Harley and post-doctoral researcher Ji Sun Choi; and Electrical & Computer Engineering graduate student Hojeong Yu.